Our look at trams from outside of the British Isles moves on this week as we head to the Hungarian capital city of Budapest. A city that has an extensive public transport network including a fleet of around 600 trams of various different types. All public transport in Budapest is run by Budapesti Kozlekedesi Vallalat (BKV) which is a company owned by the municipality of Budapest and was founded in 1968. The tram system has contracted a bit in recent years with both conversions to metro and trolleybus operation but still remains an extensive network and there has been investment in new trams fairly recently. 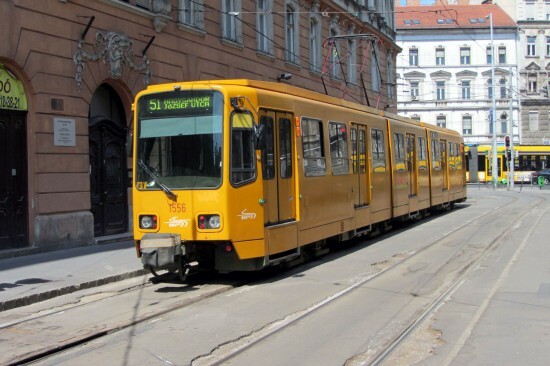 Featured in this image is a tram which has been in Budapest since the early 2000s but was not new when arriving in Hungary as it was purchased from Hannover in Germany. It is a Duewag type TW6000 tram built between 1975 and 1982 and there are now over 100 of this type in Budapest with 93 acquired from 2001 and a further 20 in 2012. As they are wider than the standard trams in the city these are constrained to certain routes. This is no. 1556 which is at terminus of route 51 at Mester Utca on 17th May 2012. A Siemens Combino can just be seen in the background on either route 4 or 6 on Ferenc Korut.